Osman Havolli, was born in the municipality of Podujevo. He completed his elementary and secondary education in Podujevo, and the Faculty of Law at the University of Pristina in 1982. Postgraduate studies at the University of Pristina, Faculty of Law – Master’s degree program, Criminal justice, and on February 28, 2009, before the Criminal Justice Graduate Committee, defended successfully his master’s thesis entitled “Indictment - Confirmation of indictment”. He has worked in the capacity of associate professional in the Legislative Committee within the Executive Council of the Kosovo Assembly, in conjunction with the legal provisions in the economic and financial field. Since 1988 he was appointed a judge of the Municipal Court in Pristina until 21.07.1992, when under coercive measures he was dismissed along with other judges. From 1993 he worked as a lawyer until 20.07.2000. Afterwards, he was re-appointed as a judge of the Municipal Court in Pristina, specifically in the area of criminal law, and in accordance with the law, as a single judge, and panel judge. He worked as a Criminal Court judge for 10 years, i.e. until September 16, 2009, when he was admitted to the Kosovo Bar Association, and currently practices law. 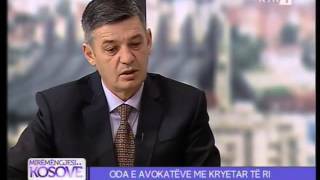 President of the Regional Branch of the Kosovo Bar Association in Pristina, elected by the Elective General Assembly on 30.10.2012 until the end of his term on 14.11.2015. Regarding professional development, he was a trainer at the Kosovo Judicial Institute in the field of criminal justice. He has written several research and scientific papers, which were presented during training. Certified as a training instructor from the International Development Law Organization (IDLO), and has participated in a considerable number of training programs in the field of legal infrastructure. He has published scientific papers in the Kosovo Bar Association’s “Bar” bulletin. President of the Kosovo Bar Association, Osman Havolli, at the same time practices law, with head office in Pristina.